Workpiece touch probes are essential to series production, tool making and mould making. They help reduce setup times, increase machine usage time and improve the dimensional	accuracy of the finished workpieces. Measuring systems for inspection and acceptance testing of machine tools provide precise and valuable measurements for both machine tool builders and users. 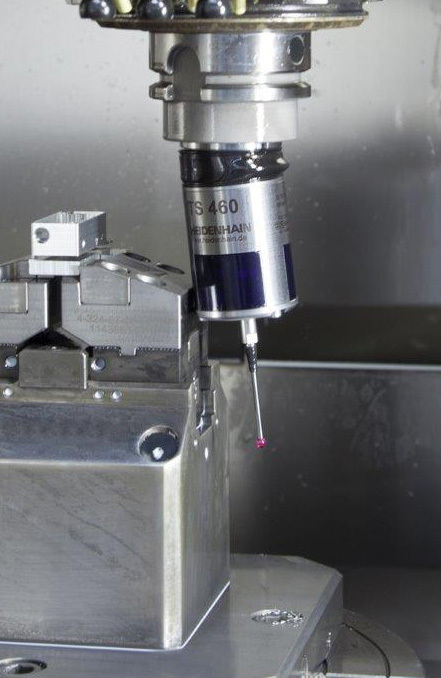 A TS workpiece touch probe from HEIDENHAIN is specifically designed to be used on machine tools, especially milling machines and machining centres. TS workpiece touch probes reduce time and costs by automatically running setup, measuring and verification tasks directly on the machine tool itself. Automatic tool measurement on the machine ensures successful series production, which depends on consistently good workmanship, detection of wear or tool breakage, especially when machines run unattended for extended periods. it also prevents the increased costs incurred from having to scrap or rework a piece.